We would tread cautiously after the FSSTI’s strong outperformance, notwithstanding the rise in consensus estimates after 1Q18. We have a 2018 year-end target of 3,720 for the FSSTI (based on mean PE and P/B). Rotation into selected laggards could also offer a better risk/reward at this juncture, in our view. Good momentum in 1Q18 earnings, with consensus up slightly after 1Q18 results. We are encouraged by the decent showing in 1Q18 corporate results, where 15% of earnings were ahead of expectations and overall consensus earnings growth was raised by 1ppt. Currently, we forecast EPS growth of 10.2% y-o-y for each of 2018 and 2019. 2018 GDP growth supported by manufacturing and services. 1Q18 GDP grew 4.4% y-o-y and was in line with our and consensus forecasts. Driving 1Q18 GDP growth were the twin engines of manufacturing (+9.8% y-o-y) and services (+4.1% y-o-y). On 24 May, the Ministry of Trade and Industry (MTI) narrowed its 2018 GDP growth to 2.5-3.5%, which was previously 1.5-3.5%. This compares to UOB GEMR forecast of 2.8%. Resilient global growth but eyes on interest rates and geo-political risks. The latest IMF global growth forecast (as at Apr 18) is 3.9% each for 2018 and 2019 (both unchanged). The World Bank’s latest update was in Jan18, where there was a slight upgrade in 2018 and 2019 global growth forecasts of 3.1% y-o-y (previously 2.9%) and 3.0% y-o-y (previously 2.9%) respectively. Economic indicators such as the PMI are also supportive with major markets such as the US, China and the EU enjoying resilient PMIs. In Singapore, Apr 18 non-oil domestic exports (NODX) rose 11.8% y-o-y, reversing the decline of 3.2% y-o-y recorded in March. The 11.8% rise was actually higher than consensus forecast, although lower than UOB GEMR’s estimate of 14.4% y-o-y expansion. The rise in April’s NODX was underpinned by non-electronics exports (pharmaceuticals +43.7% and petrochemicals +15.1%), which managed to offset the fifth month of decline in electronics exports (-6.9% y-o-y in April). Looking ahead, investors will focus on the impact from rising interest rates and how this could impact global growth. Also in focus would be the potential trade wars as well as the uncertainties in the Korean Peninsula. FSSTI one of the top performing markets. YTD, Singapore has outperformed its Asean peers and is one of the top four markets in terms of performance (the top three being NASDAQ, SENSEX and TAIPEX). 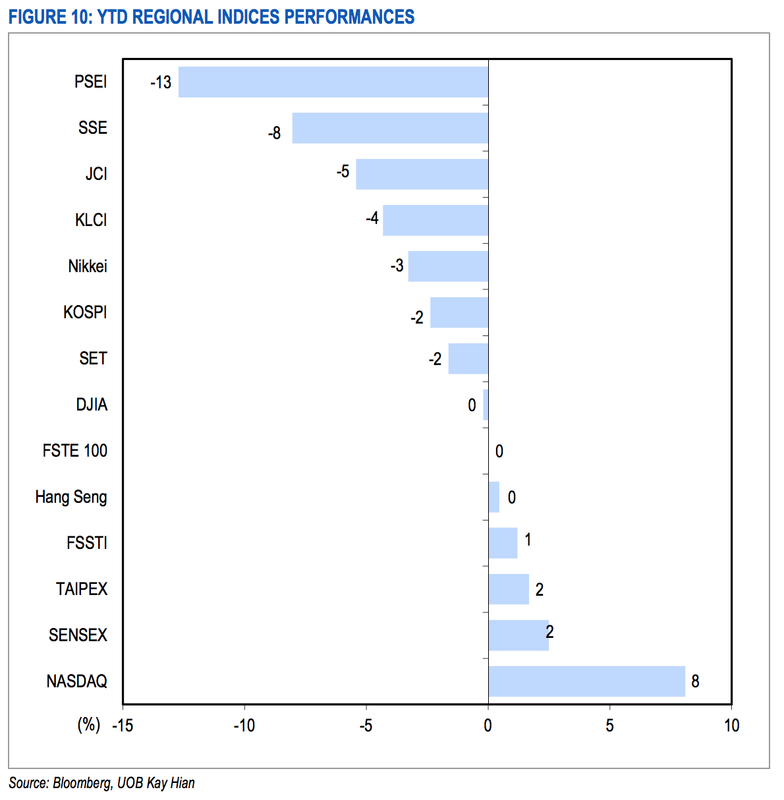 The FSSTI is up 1% YTD, compared with its Asean peers’ -13% to -2% during the similar period. In the case of Singapore, the outperformance has been quite skewed towards banks, which account for circa 30% weighting in the FSSTI. This sector has been on a tear, rising 2-14% ytd as earnings, asset quality and dividends particularly DBS Group Holdings provide reasons for the market to continue re-rating this sector. Edging closer towards decade high. After the strong performance of the FSSTI over the past year, the Singapore market is trading 5% below its decade-high level of 3,641. If we look further back, the FSSTI’s all-time high was 3,831 and at current levels, the FSSTI is trading at a small 11% discount to the all-time high in Oct 07. On a valuation basis, the FSSTI is trading close to its long-term mean, which could suggest a selective approach is appropriate given fair valuations, notwithstanding the expected acceleration in earnings growth. Limited discount on PE basis but dividend yield still attractive. On a PE basis, the FSSTI’s consensus current PE of 13.7x looks fair as it is only trading at a small discount to Asia ex-Japan’s PE valuation of 14.3x. However, the FSSTI’s average dividend yield of 3.8% still compares well to the region’s average dividend yield of 2.8%. 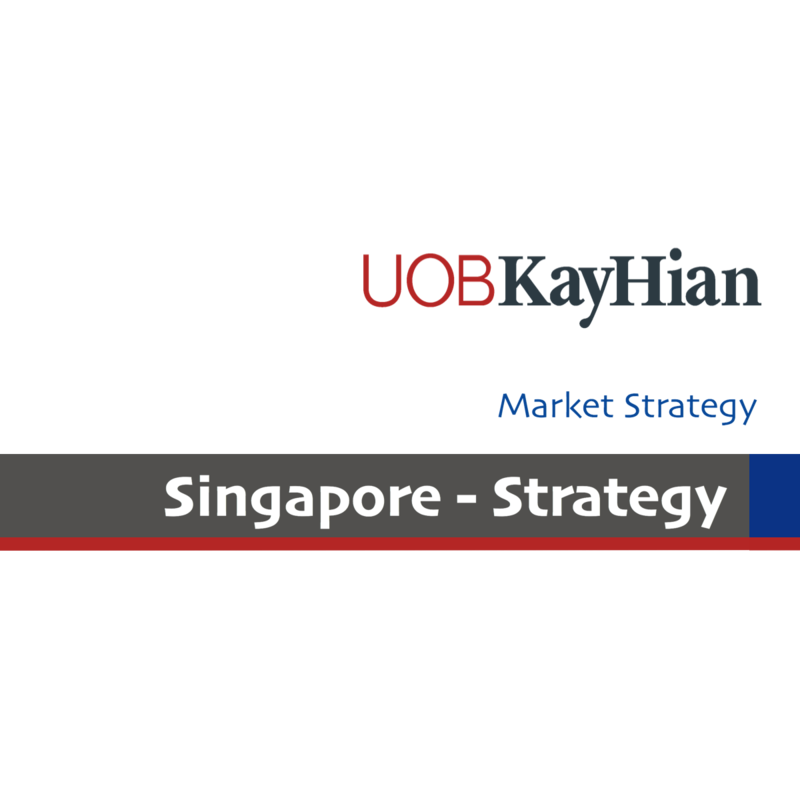 After the FSSTI’s outperformance since 2017, the Singapore market is trading at only a 5.4% discount from its 10-year high, which is considerably lower than the region’s average discount of 11.0%. Good earnings momentum in Singapore. Based on consensus estimates, the FSSTI’s 2019 EPS growth is projected at 8.6%. This is below our forecast of 10.2% y-o-y. Our 2019 estimates are in the middle of Asean peers’ consensus EPS growth range of 6.9-12.2%. On our estimates, the FSSTI market EPS growth forecast of 10.2% is one of the highest since 2010. 2018 year-end target of 3,720. We have a year-end target of 3,720 for the FSSTI, based on an equal blend of long-term mean PE and P/B. While there could be potential earnings surprises, particularly for heavyweight banks that could expand PE valuations, we think our assumption of mean P/B is generous since 2018/19 market ROE forecasts of 9.2% and 9.7% respectively are still below the long-term mean of 11.0%. At 3,720, this would have exceeded the FSSTI’s decade high and would be only 3% below the all-time high of 3,831 in Oct 07. Given such lofty levels, we would tread cautiously. In our view, a possible upside risk in our target could emanate from better-than-expected corporate earnings. As an indication, if there are significant beats in 2Q18 and if the market factors in further upgrades, there is a potential for the FSSTI to even trade up to a 5-10% premium to its long-term PE valuation, which would suggest a valuation target of 3,820-3,920. With interest rates on the uptrend, this could temper the growth outlook and selected interest rate-sensitive sectors. UOB GEMR expects a further 35bp rise in the three-month SIBOR to 1.85% and for two more Fed rate hikes for the remainder of 2018. In our view, a gradual and predicted rise in interest rates along with resilient growth would not necessarily be negative for equity markets. Look for S-REITs with potential growth upside. Though rates are on the uptrend, we remain upbeat on S-REITs as we believe S-REITs could transition to growth stocks during periods of a pick-up in economic activities, translating to higher rental rates/capital values. Currently, S-REITs are at a 3.19% spread over risk-free rate but during upcycles (2004-07), the spread over risk-free rate narrows to 2.79%. Assuming this to repeat suggests an upside of 7.4%. While rising rates are generally not positive for dividend yield stocks, we believe it is important to study the context of the increase as a gradual rise in rates accompanied with robust economic growth is actually healthy as it would suggest a transition of S-REITs into growth vehicles. BBEY suggests equity in fair value territory compared to bonds. In order to compare bonds and equities, which are competing asset classes, we use bond to equity earnings yield (BBEY). The BBEY ratio since 2000 suggests that investors could be indifferent to equities and bonds as the current BBEY of 0.36x is close to long-term average or 0.37x. Nevertheless, the expected rise in interest rates would hurt bonds more directly, particularly the long duration bonds, and make equities slightly more attractive. We forecast a market EPS growth of 10.2% y-o-y in each of 2018 and 2019, which is a good momentum after the earnings turnaround in 2Q17. Our 2018 market EPS growth was raised to 10.2% from 8.0% after 1Q18 results. 2018 EPS growth is projected to be very concentrated in banks but this is expected to broaden out in 2019 to other sectors such as aviation, shipyards and plantation. The projected growth is very promising as the last time market EPS growth hit double digits was in 2010. So far, 1Q18 reporting season has mostly ended and the signs are promising, with a 1ppt rise in consensus EPS growth post the results. Compared to our forecasts, circa 15% of 1Q18 results were above our expectations whereas 59% were in line with our expectations. Unfavourable regulatory changes in Singapore, including potential measures to cool the property market. Stock Strategy Singapore - Stock Picks For The Rest Of 2018.